As we have all heard, sitting is the new dying especially given the research showing that the detriments of sitting all day are not undone by regular exercise. An hour run cannot undo the damage that eight hours of sitting causes, unfortunately. That is why, for the last four years, I have been using a standing desk at work - every day, all day. My legs used to feel a little leaden by the end of the day, but not so much anymore. I love my desk. But at home, where I also do a fair amount of computer work, I sit. Every day and sometimes for hours. 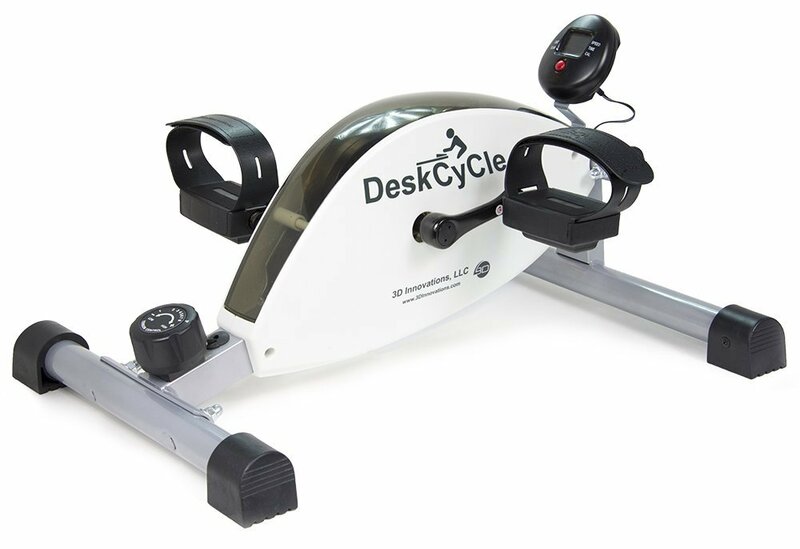 Therefore, as part of my mission to increase my baseline level of activity this year, I just invested in a DeskCycle, basically a stationary bike that fits easily underneath a standard desk and allows you to pedal at various levels of resistance as you type. The bike also comes with a little LCD display that shows you distance, speed, calories burned, and time. I am biking right now. Sitting on an exercise ball while working, raises your energy expenditure by 6% over sitting at your chair. Standing at your desk raises your energy expenditure by 30%. Pedaling the DeskCycle at only 1 revolution per second, at resistance level 3, raises your energy expenditure by 100%. My new DeskCycle is no treadmill desk, but nor did it cost $3,000+ or take up half of my small home office. (Also high on the list of pros - you can't fall of a DeskCycle). Rather, after $129 and 10 minutes of assembly I was set. It did take a little to get used to the pedaling action (it feels like a recumbent bike) and I did end up using the "tether" to secure my rolling desk chair to the bike, but short of those adjustments, pedaling while I work at home has become second nature. The bike is very smooth and quiet, I feel my legs working, and I even notice that my core is actively working to keep me better engaged with the pedals. Just as I spent years evangelizing my standing desk, I just spent 30 minutes chatting up people at a toddler's birthday party about the benefits and logistics of a biking desk. It feels like such a no brainer that I am almost embarrassed that I didn't think of this sooner, and I would highly recommend that you try one. The best way to fit exercise in is to make it as easy as possible to move more. Pedaling while you work is one more way to make that happen. WebMD Article and Atlantic Article describing research that showed that just 23 minutes of pedaling a day could improve the health of people in similar desk-bound jobs. HuffPost Article describing different reviewers reaction to using the DeskCycle. Amazon link where you can see that it is possible to get a desk bike for less than $30.